We are happy users of Apache Kafka. We make heavy use of it in SPM, in Search Analytics, and in Logsene. We knew Kafka was fast when we decided to use it. 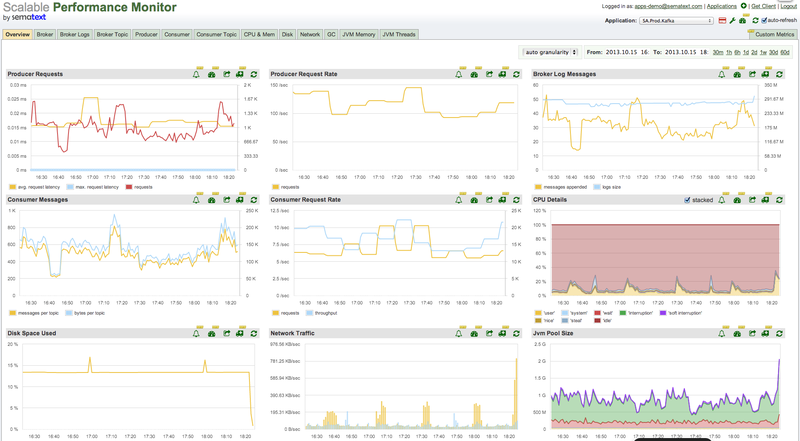 But it wasn’t until we added Kafka Performance Monitoring support to SPM that we saw all Kafka performance metrics at a glance and admired its speed. We are happy to announce that in addition to being able to monitor Solr/SolrCloud, Elasticsearch, Hadoop HDFS and MapReduce, HBase, SenseiDB, JVM, RedHat, Debian, Ubuntu, CentOS, SuSE, etc. you can now also monitor Apache Kafka! Of course, SPM can also alert you on any Kafka metric and can do so directly via email or via PagerDuty, using either traditional threshold-based alerts or our recently announced Algolerts. SPM supports Kafka 0.7.x, and we’ll be adding support for Kafka 0.8.x shortly.